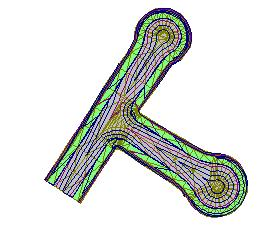 In this tutorial our design brief is to design two cul-de-sacs. A rough sketch of what we require is shown. We have road1 coming into a cul-de-sac. Along road2 we have a second short road which we have labeled road2 that also feeds into a cul-de-sac. 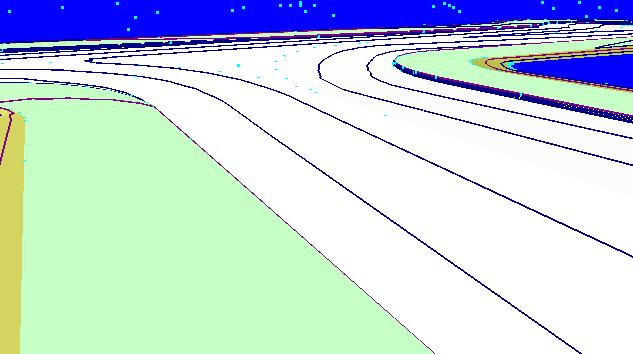 In this tutorial we are initially going to use CDS to design the plan view of the road network. In the second section we are going to investigate two alternative design procedures to create a finished surface. Design procedure 1 will involve a design along the two sketched center lines. Very much how we design a straight section of rural road. Design Procedure 2 will show an alternative design procedure. 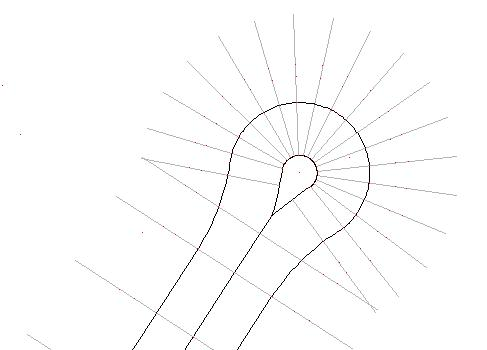 In this case we do a profile design along the center-lines of each road. 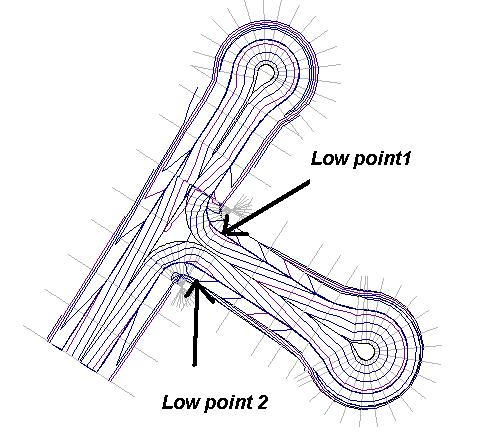 We then design along the continuous curve that runs around the whole structure. We need to design the road / structure in plan view. This would normally be incorporated into a larger subdivision design and road easements would most likely already be defined were these roads can fit. We have supplied the job culdesac. 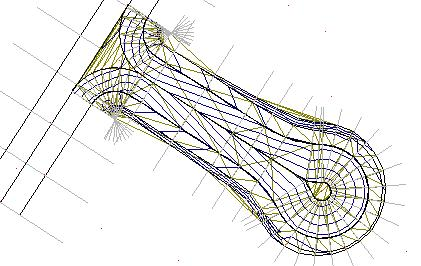 This job is supplied with some background height data as well as 3 strings defining the two road center lines as well as a string defining the kerb that runs around the two cul-de-sacs. The following describes how we arrived at this point. First we need to define the position of the Road1 center line. We have been given the coordinates of the start point1 (E231.417,N375.753) and the position of point 2 (E250.078,N404.592) which is the start point of the cul-de-sac. Enter these points by using the “Points” menu and then “Add”. Click the points in and modify there Easting and Northing to the exact value. 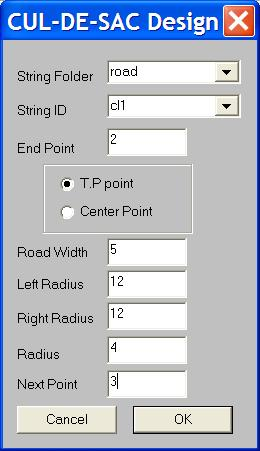 Create a string in the road folder with an ID of cl1. If you are not sure about how to do this we suggest that you look at the introductory chapters again. We now want to define the cul-de-sac. If you look at the dialog opposite we have filled them in with the appropriate values. Once you click on the OK button the appropriate point numbers are added to the database. 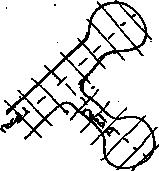 We are going to create one long string that also encompasses the second cul-de-sac which we still need to define. The second cul-de-sac is defined by the string running from point 39 to 40. There coordinates arei 39 (E242.072,392.219) and point 40 (E258.303,381.716). Join them together with a string and place in folder road with an ID of cl2. We are now in a position to design the 2nd cul-de-sac. The dimensions of this cul-de-sac are width of road 5m's, arc in 12m's, arc out 12m's and bulge radius of 5m's. 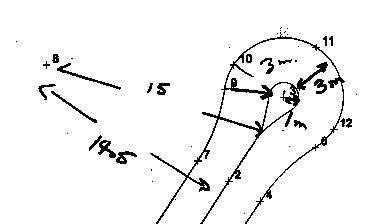 To create the bounding curve we also need to calculate the intersection points 28 and 29 as shown opposite. These can be calculated in two different ways. One is to use the 2 bearing intersect (Cogo -> Intersect Bearing & Distance -> 2 Bearing. The other is to use the parallel offset calculation dialog. Ie Cogo -> Offset Calcs -> Parallel Offset. We also want to add in a small arc at the intersection for appearances. We have decided on a radius of 3m's. Use the Cogo -> Curves -> IP & Radius to calculate it. We have calculated the points 30 to 34 respectively. This contains the natural heights and the 2 road center lines and the bounding kerb. In this case we have sketched in roughly where the section lines will run. We have ignored sections around the intersection area of the roads except on the left side of road1 as the intersection has no effect. Through the cul-de-sacs we have ignored the fact that road bows out here. 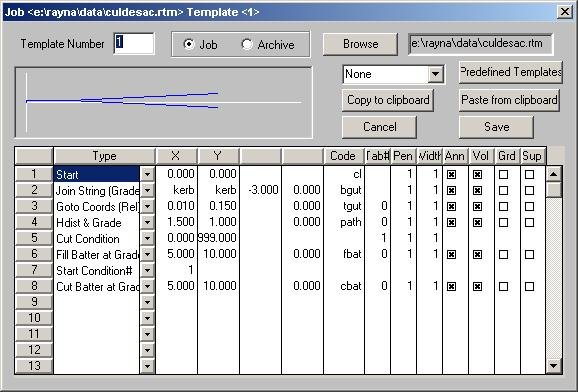 It also means that we would need to define individual section templates through this area - and it would be unlikely that the cul-de-sac would have a nice constant grade around it. In this case we have modified the center line definitions to include a circular arc that defines the center of the cul-de-sac bowl. The center line goes down the center of the road; reaches the center of the bowl and then runs around in a circle. Here we can define some sections only lying on the left of this string. This way we make it easy to define the sections around the cul-de-sac as the grades etc can be pretty constant. If the ground undulates we may need to vary grades around to minimize cut and fill. Do the designs for road1 and road2. Then add in a couple of small profiles that join from road1 center line to road2 center line and on the other side a short profile that joins from road2 back to road1. It is important on these small profiles that the design heights and grades match both ends of the road. Make the design of road2 run from center line of road1 around arc onto where road2 now is around small arc in cul-des-sac bowl back along towards start of line and then around arc to finish back on road1. This has the advantage that we can do the design in one go for the intersection and road2. We have to remember not to display sections on the way back however. As we can see there is no right and wrong way to do any of this. We simply supply the tools which hopefully makes your job easier. For a small design like this in reality the dozer driver would probably not even need the intersection design. For this tutorial we have decided to go with option3 which you can see opposite. 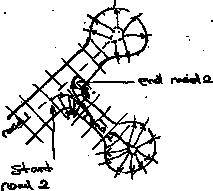 The next step is to modify our initial center line designs to reflect the small cul-de-sac arc at the end of road1; together with the cul-de-sac center for road2 with the lead in and lead outs to road2. First bring up the job as created in the horizontal alignment. The job name was culdesac1. Our first step is to create the small arc around the center of the cul-de-sac. We have sketched here the relevant cul-de-sac dimensions and how we intend to design in the small arc at the center of the cul-de-sac. We have in fact decided to create the center of the cul-de-sac as a tear drop shape. The idea being that the width of the slope is constant around the cul-de-sac and still constant along the lead in arcs back to the center line of the road. We need to design a couple of points to define the mini center. The radius of the cul-de-sac is 4 m's. We have decided to have the arc in the center to have a radius of 1 m. Please use your own numbers here. Therefore the distance from outside of this center arc to outside of the cul-de-sac is 3 m's. The distance from point 8 to point 7 (lead in radius) is 12 m's. Therefore at the point the center starts is 15 m's from point 8. Our first step is to define the position of this point. CDS contains a function to calculate the intersection of a bearing and a distance. In this case we wish to find the point that lies 15 m's from point 8 and also lies along the line from point 2. From the "Cogo" menu and then "Bearing and Distance Intersect" sub menu and then "Bearing & Distance Int" menu item. Fill in the dialog as below. Point 2 lies along the center of road1. To get the bearing make sure the Bearing edit box has the focus. Simply click into it and the cursor will start flashing. Now go back to the main screen and click along the line. The bearing value will be entered into the bearing edit box. Point 8 is entered as well as 15 m's as explained above. Press the Apply button. On the screen will be drawn a circle as well as the straight line. There is often 2 solutions. Click on the screen at the position of the appropriate solution. Point 38 is entered into the database. We now need to calculate the end point of this arc. This point lies along the line joining 8 to point9 but extended so it is at a distance of 15 m's from point 8. From the Cogo menu select "Bearing and Distance". We are radiating from point 8 so click on point8 on the screen or alternatively type in 8. Next we need to add in the bearing value. It would be highly unlikely that we know this value in our head. CDS can calculate it for us. Click into the bearing edit box and type in the letter p. We are now in point to point mode. We may simply type in 8,9 and then enter and the value will be filled in. We may also select from the screen. After type in P click on the first point 8 and then on point 9. Hit enter or tab key and the value is filled in. We have called the new point number 36. Press the "Apply" key and the new point is added in. We now need to calculate the out going point on the center structure of our cul-de-sac. ie the point 15 m's from point 5 and in line with the line joining 5 and 6. Use the Cogo -> Radiate menu item to calculate it and call it point 37. Now when we get to point 2 we wish to continue to point 38 so add in this point. We are now in an anti-clockwise arc center point 8 and go to point 36. We are now at the small arc. ie clockwise arc, center point 3 until we hit point 37. Now at an anti-clockwise arc center point 5 until we hit point 38. This defines our new center line. We are now in a position to design this road and cul-de-sac in the same way we easily define our traditional rural road. We first need to interpolate profiles and sections along the line. Use a distance left and right of 8 meters. We can create sections along the straight every 5 m's and a distance of 1 m around any arcs. Once this has been run refresh the screen ( Simply single click the center button on your mouse. ze for zoom extents has a similar result. You will see the position of the sections drawn in light grey. First thing is that on sections around the arcs we have sections left and right. For these we only want the section on the left. To de-clutter the screen (this is optional) we need to delete any points with positive offset if they are on an arc. We can do this from the appropriate section view. First show profile view - ie click on the profile view icon. Show the section view by clicking on the appropriate icon. From Windows menu do the "Tile Roadworks" option to display the 3 views of our road. To tidy up this section click into the section view. 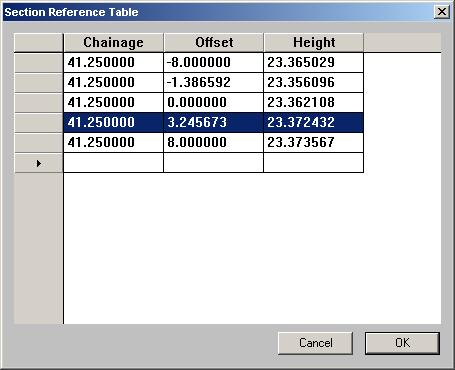 Now right click and select the reference coordinates menu item. It shows a table with all the points in this section. We prefer to delete the points with an offset of 3.24 and that at 8. Simply click into the left most column and the whole row is highlighted. Hit the delete key and keep hitting it until all the appropriate points are deleted. Do this for any appropriate sections. f you look at the sections around the cul-de-sac bulge by inspection it would be good if we had some more sections. To add some extra one's in right click the profile view and select the “Add Sections” menu item. Specify the chainage and the offsets right and left ( we have used 8 left and 0 right else where. Also feel free to delete any sections to make the sections even. Right click in the section view and select the “Delete Section” menu. We have done this and create the following set of sections which are shown in grey in the plan view shown. 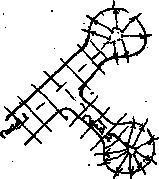 Also remenber that any design triangles and hence contours consist of straight lines so the closer together any sections around the cul-de-sac bulge the better. Next step is the section design. For this design we wish to grade along the appropriate section until we hit the kerb string line; go up to the top of the gutter; draw in a footpath and then grade to the natural surface. At present you need to be running a version of CDS Premium later than mid September. Below we have the section as designed in the "Standard Templates" sections as well as a typical section in the job. For those sections where we have templates left and right we have template 1 on the left and template 2 on the right. Template 2 is slightly different in that the point codes of the points are prefixed with a r to indicate we are on the right of the road. Also we don't annotate the center point; otherwise it would be in the job twice. We are now in a position to plot the plan, profile and sections. 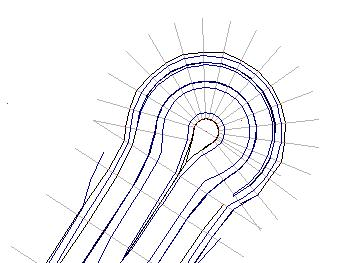 We are now in a position to put our calculated design points back into the database and create some finished contours to check our design. Obviously however the area around the intersection of road1 and road2 will be incomplete. 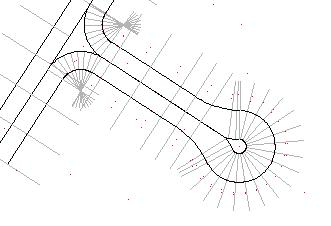 The cul-de-sac bulge design contours are shown at the right. We will return to the creation of the design surface in more detail when we have finished the design of road 2 including the intersection. 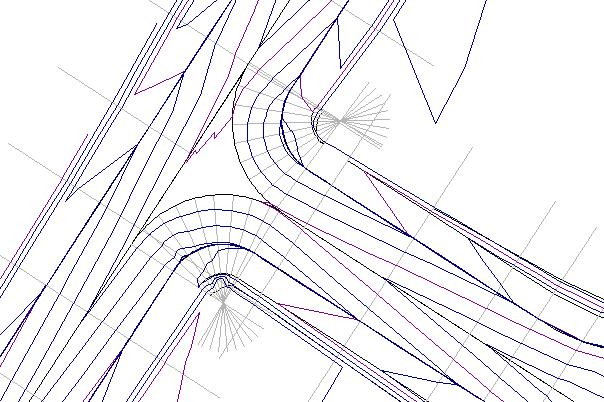 As mentioned earlier we are going to include the intersection design into the general design of road2. To this end we need to define a lead in arc that runs from the road1 alignment onto the alignment for road2. The center line is then going to travel down to the cul-de-sac bulge and return and join back onto road2 via another arc. The kerb that defines the edge of road1 into road2 consists of the arc from point 33 to 35 with a center point of 34. Its radius is 3 m's. The width of both roads is 2.5 m's so we simply need to create a new arc here with a radius of 5.5 m's. Using "Bearing & Distance" menu item from the "Cogo" menu. Calculate a new point from point34 in the direction of point 33 for a distance of 5.5 m"s. Repeat to calculate a point 5.5 m's from point 34 in direction of point 35 for a distance of 5.5 m's. Do for the outgoing arc as well. We now need to redefine the road2 center line. From "String" menu select change. Our new calculated points were 100,101 and 102. (The first and last point on road1 is the same and this is point 101. The completed definition is seen below from the change dialog. We can now do our profile design. There are a number of constraints we need to be aware of. The height and grade at the start needs to match the height and grade of Road1. The height and grade at the finish needs to match the height and grade of Road2 at this position. The height at the start of the center of cul_de-sac needs to match the end at the same point. The profile design is shown below. To satisfy the start requirements we clicked in a point at chainage 0. Display the IP table at enter in height of 23.285. Calculate a new point along at a grade of 0.3%. We also set the point at the end of the start arc to be down at a grade of about -1%. We need some sort of negative grade here otherwise the main Road1 will have a big bump in the middle. Depending on the relative importance of the two roads we can adjust this accordingly. In the profile design below the high point was the top of the cul-de-sac and we have set the in and out chainages of the cul-de-sac middle to be the same height..
On inspection our design may lead to some problems with drainage around the intersection area. Not being an experienced designed I am not sure so lets continue and view the final contours to see what happens. change profile design along Road2 by raising center line at this point. The tradeoff is more off a bump along Road1. we could decrease the grades of the template along this area which would bring up the height at the drain. Who noticed the problem in the contours above. Going out from the end of Road2 we appear to have a problem joining back onto Road1. 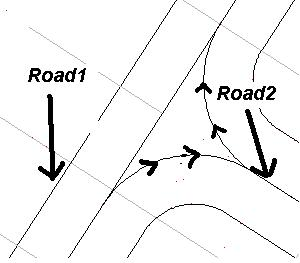 The problem was some design points on the right of Road1 that cut across between some of the design contours for Road2 were it joins on. To fix simply delete the 5 design points from Road1 at this point and only use those from Road2. The contour plan below was designed by raising the design profile of Road2 by about 50mm at the appropriate place. As mentioned we now have water run-off but our intersection design is probably not as good. Please remember however that we are plotting contours at 25mm so I would suggest for a small not very well used intersection that if is probably good enough. CDS Premium also allows the 3D view of the job. I have included screen shot below. With the colors selected it is more of a visual check that we have not stuffed something up.